Beautifully engraved certificate from the Liberty Starters Corporation issued in 1919. This historic document was printed by the Broun-Green Company and has an ornate border around it. This item is hand signed by the Company’s President (Duff Maynard ) and Secretary and is over 82 years old. This is the first time we have seen this certificate. 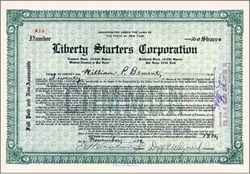 Liberty Starters Corporation made starters for Ford Moror Company. Liberty subsequently went into receivership as a result of mismanagement. Barnes v. Andrews, was a case where Andrews was a director and resigned one year later in 1920. Andrews was largest shareholder and had only attended two board meetings and missed one. The Judge held Andrews violated his duty of care. Directors can act only by counsel and advice to the managers. But directors have a duty to keep themselves informed which Andrews did not fulfill. Andrews should have pressed the company's president, Duff Maynard for details about the status of the business. However, the judge said that to show Liberty’s losses would not have occurred if Andrews had properly performed his more than anyone else, as the largest shareholder, was not a sufficient defense because he still has a duty to other shareholders. He did rule, however, that an inattentive director will not be liable for a corporation's loss if full attentiveness by all the directors would not have saved the situation.